Texas is one of only four states that have javelina, otherwise known as the "collared peccary." 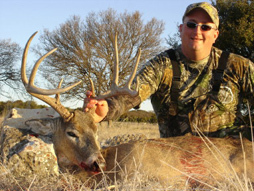 Of these southwestern states, Texas, by far, has the highest population of pigs, very affordable hunting licenses and the lengthiest hunting seasons with some areas open year-round. The "Feral Hog" population in Texas is absolutely exploding. Hogs are such prolific breeders that they have managed to expand their traditional "home range" to extend from one end of the Lone Star State to the other. If there is thick brush and any "live" or "open" water on a ranch, you're going to have "wild hogs" sooner or later. Since sow hogs can raise several large litters of pigs per year thus resulting in much crop and pasture damage, along with destroying ground nesting birds and other wildlife habitat, the State of Texas is allowing Sportsmen the opportunity to hunt them; year round, without bag limits, day or night, with any firearm or archery equipment, with any vehicle including aircraft! We have personally hunted javelina and feral hogs for 34 years in South, West, & Central Texas and have been offering guided javelina, feral hog, and predator combination hunts for 31 years with nearly 100% success. Our hog hunts have been in traditional areas of South Texas and North Texas but now have expanded to include almost every ranch in our portfolio of ranches. Our landholdings are very large with some ranches exceeding 45,000 acres. By harvesting a limited amount of javelina per year, we are able to maintain a good population of adult hogs, most of which have large tusks. The hogs, however, are a different story. 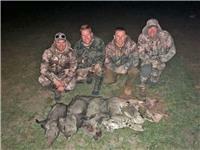 No matter how many hogs our hunters "eliminate", there are always more and more! We hunt safari style out of 4WD vehicles as well as 4x4 & 6x6 ATV's. In addition, we archery and gun hunt from both ground and elevated blinds near watering holes, feeding areas, and fertile food plots. 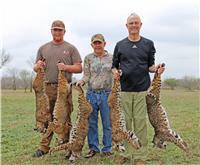 One of the most successful methods is to corn "senderos" in deep South Texas while re-tracing your route in a custom "high rack" hunting vehicle or by driving up on high points in the mountains of West Texas stopping frequently to glass for javelina, hogs, and or sometimes "free ranging aoudad sheep" on distant hills. "Still hunting" or "stalking" as some call it, along thick creek bottoms can be very thrilling as hogs and javelina often break from thick underbrush, often times literally under hunter's feet. Surveying a water hole in the hot summer is also a very successful method of hunting since both pigs and hogs love to cool themselves in the wet mud along the waters edge. Hunters can often times approach javelina into close bow or handgun range since javelina are near sighted. Feral hogs however have better eyesight and will require hunters to be more vigilant during their stalk. Food, lodging, guide, digital photos, basic trophy care, and in most instances transfers from the nearest airport to the ranch. Personal hunting equipment, gratuities for the staff, adult "spirits" and or wine, personal hunting license, expediting of trophies and transportation before and after the scheduled hunt.